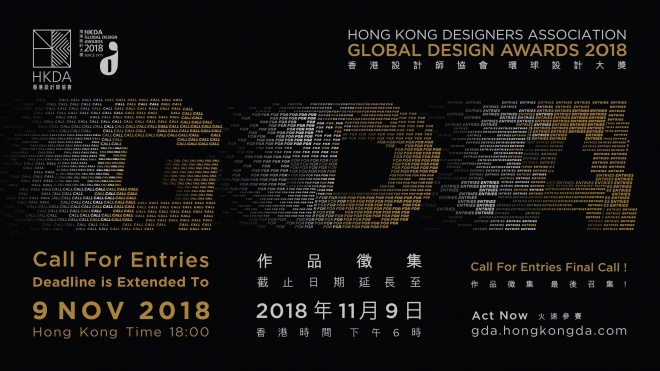 The Hong Kong Designers Association (HKDA) announced the international call-for-entries for its flagship event – HKDA Global Design Awards 2018. HKDA Awards has widely been acknowledged as one of the most established cross-disciplinary design competitions in the Asia-Pacific region since 1975. In HKDA Global Design Awards 2018, 14 world-class judges were invited to form the judging panel for digital, graphics, product and spatial design categories. Rigorous judgment will be conducted to select distinctive works, recognise the achievement of designers and thus promote the development of the design community. Only online registration is accepted. Please visit the official website as below for the details. Eligibility: The entry must have actually been launched, produced and (in the case of commercial designs) have become available in any market(s) from January 1, 2015 or after.